“Small Town Team, Big Time Dream,” the official motto of Brandon Muth and Aaron Dickey, General Managers of the team – who are also players for the UPSL Wild West side. Vacaville, about an hour and a half northeast of San Francisco, is a fairly small town, by California standards and is the home to Vacaville Elite, who are only a year into the UPSL but look like they’ve found a league which suits them. They were kind enough to answer all my questions for a Protagonist Soccer spotlight piece. Vacaville Elite were founded in 2009--but what's the story? Was it started as a place to play for adults or as a place for kids to learn to play? Vacaville Elite was founded in 2009 by President and head coach Dave M. During this time, the team was a participant of the U23 Nor Cal Premier Soccer league where the door was open to local Vacaville players who wanted to compete at the highest amateur level in the surrounding area. The idea was to give kids something to aspire to in our community and we wanted to start organically and within the boundaries of our city. Roughly 90% of the 2009-2013 rosters were coached previously by Dave during their youth soccer days. For the first 4 seasons, a majority of the players for the Elite had already been playing together since 1998 so the chemistry was natural. At the end of the 2010 season, coach Dave stepped down from coaching and was appointed as the President of the Club. The team was then handed over to player and team captain, Aaron Dickey (21 years old at the time), and Player Brandon Muth (20 years old at the time). The vision was to continue providing quality soccer for the local area because we knew there was a talented group of guys in which we felt confident could compete at a high level. We would train 3 days a week at a local park with decent grass and all we had at the time was hand-me-down equipment: cones, balls and one set of pug goals however, our belief was big and guys would show up to practice with a work-hard attitude pushing each other to be better. In 2011-2012 we opened our roster to include anyone from ages 16 and older to partake in the journey. In 2012 and 2013 we took 1st place in the Nor Cal Premier League back-to-back; this is where the two stars come from on our crest! In the summer of 2013, our 1st place position qualified our team for the Nor Cal State Cup Tournament where we went on to face the Chivas USA MLS U23 team at Cal Poly University in San Luis Obispo. This was a very tough opponent and we put up a great fight with the final score ending at 3-1 and never thought a small-town team like ours would play at this level. From that came our motto "Small Town Team, Big Time Dream". 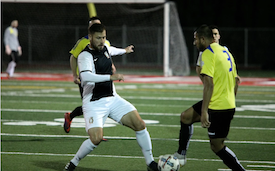 In 2014 we competed in the Lamar Hunt US Open Cup - Nor Cal State Cup Qualification Round against Juventus 93 SC Black now known as JASA in the UPSL, which we lost 2-1 with a late controversial penalty kick awarded to Juventus in the final seconds. It was a tough loss however, we accomplished something much bigger than we ever anticipated. In 2015 we decided to take a break from league play and at the time was not certain what the future would hold for the Vacaville Elite. Fortunately, it was the consistent persuasion via past and future aspiring players who constantly reached out and demanded us to bring back the team. This was the driving force to the club’s re-entry into league play for the upcoming 2016 season. In 2016 we competed in the Liga Nor Cal spring, summer and fall seasons until the fall of 2018 where we made the jump to the UPSL. We decided that it was the right time to make the switch. We felt it was the most beneficial move for the club as a whole as we wanted to play on a National level whilst bringing more exposure to our players and our club. Our goal is to not only provide advanced training via practices and high-level game play but to also open doors to Colleges/Universities and Pro-Clubs worldwide to our players. In the end, it is about the players and we strongly believe this. A few clubs have migrated from the NorCal League to either the NPSL or in your case, the UPSL, without a proper Promotion / Relegation system in place, is this the natural course for clubs who outgrow their regional league? How noticeable has the jump up been; is the competition better or is it just a matter of longer travel to face clubs further away? In regards to this being a natural progression for Nor Cal clubs, I believe that it is truly case by case. In our situation, we have found a sustainable blueprint that works for our club and transitioning into a National League just fit well with the direction of the Adult team representing our club as a whole. We really like the professional standards set forth by the UPSL, and have enjoyed our experience thus far. In the Bay Area and most of the surrounding cities in Northern California, it is a hotbed for talent. All of these quality teams in such a close vicinity have provided us with top level competition and we have hung in there against powerhouse cities like San Francisco, Oakland, Sacramento, Davis… just to name a few. Most people would be surprised of the amount of talent coming out of even the smallest cities in Northern California. We feel we are an example of this; a city of 100,00 people trying to take on the nation. “Small Town Team, Big Time Dream”. There looks to be four levels of play at your club, including three developmental squads, how many of your first team players have come up through this funnel? In a town situated halfway between San Francisco and Sacramento and surrounded by all sorts of soccer teams, how important is it to build your own players through those developmental stages? Our Developmental Youth Teams are just being introduced this Spring. Until now, we have only had a Men's Semi-Professional team, but the ultimate goal has always been to provide a thriving youth program. We will start with a boy's U12, U14, U16, and U18 team while the introduction of girl’s teams is on the agenda for the very near future. Our mission is to focus on proper development for each age group and skill level while also incorporating other important things like diet, injury prevention, team synergy, life skills, etc. into the developmental program. We are excited about providing something different for not just our community but our local region. For many years we have hand selected players from 16-17 years old to train with the adult side to prepare them for their potential debut with the first team. We look for talented youth players who are not playing with any club and in many cases, this is due to lack of financial support and/or their demographics. We have seen some of these young players come to our team and then go on to play in College, overseas, NPSL and even the USL. Our Club is big on helping out our players and one way we do this is by writing letters of recommendations for Colleges/Universities as well as for other clubs that are more prestigious. Nonetheless, if there is any way we can assist our players in achieving their soccer goals or getting them to a higher level, we are all about it. Giving the kids a chance to grow into the first team is excellent, but once they get there, does the club help them find opportunities to play at the next level? Letters of Recommendation to Colleges or reach out to lower level pro teams like Sacramento Republic or Las Vegas? We feel it is very important to bring our players up through our developmental program and then all the way up to our first team. In the city of Vacaville, a majority of the more talented players are traveling out of our city to play for different clubs in other cities and we would love to change this and retain our homegrown talent. This will not happen overnight but you know what they say, slow and steady wins the race! Your organization seems really strong in terms of building quality players and providing a youth funnel, but what's your fan support like? Do you have a supporter’s group? Chants, tifo, scarves? How important are those elements to a communities' soccer culture? We currently do not have a support group or any chant songs, but we would love for the community to get behind the Club and create one. We have beanies and a plethora of other team merchandise but no scarves as of yet (this winter! ).